As protégé David “Honeyboy” Edwards described him, Williams in his early Delta days was a walking musician who played work camps, jukes, store porches, streets, and alleys from New Orleans to Chicago. He recorded through five decades for Vocalion, OKeh, Paramount, Bluebird, Prestige, Delmark, and many others. According to Charlie Musselwhite, he and Big Joe kicked off the blues revival in Chicago in the ’60s. When appearing at Mike Bloomfield‘s “blues night” at The Fickle Pickle, Williams played an electric nine-string guitar through a small ramshackle amp with a pie plate nailed to it and a beer can dangling against that. When he played, everything rattled but Big Joehimself. The total effect of this incredible apparatus produced the most buzzing, sizzling, African-sounding music one would likely ever hear. Anyone who wants to learn Delta blues must one day come to grips with the idea that the guitar is a drum as well as a melody-producing instrument. 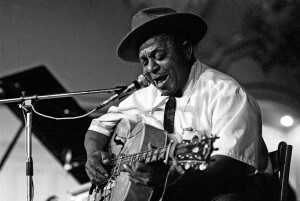 A continuous, African-derived musical tradition emphasizing percussive techniques on stringed instruments from the banjo to the guitar can be heard in the music of Delta stalwarts Charley Patton, Fred McDowell, and Bukka White. Each employed decidedly percussive techniques, beating on his box, knocking on the neck, snapping the strings, or adding buzzing or sizzling effects to augment the instrument’s percussive potential. However, Big Joe Williams, more than any other major recording artist, embodied the concept of guitar-as-drum, bashing out an incredible series of riffs on his G-tuned nine-string for over 60 years.